When we’re making a logo into a 3-dimensional sign, we think about how we can make different parts of the sign so it stays true to the logo while being physically possible to manufacture. 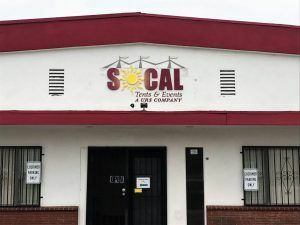 SoCal Tents and Events is a party equipment rental service with a unique logo that found us online. After seeing the building signs we’ve done before on our website, they decided to contact us for their building logo sign. The first thing we want to look at when creating a sign of a logo is the logo file, and where the sign will be going. We need to know the measurements of where the sign will be going so we can lay out the proper dimensions for a proper estimate. The first issue we wanted to tackle was the tents at the top of the logo. We realized right away that it would be a challenge because of how thin some parts of the logo were. If we cut it the way it was shaped in the logo, it could break very easily. To avoid this from happening, we actually put a digital print on a larger piece of clear acrylic than the tents. The top part was cut to the shape of the logo, but the bottom was a straight line which resulted in a more stable piece. We solved the issue with the tents but extending the size of the acrylic created another issue. Since the acrylic for the tents was now going to be lower, it would overlap with the sun ray that extends up. 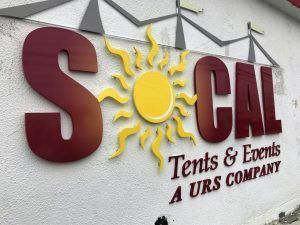 The tent logo was going to be 3/8″ so we decided to mount it flush to the wall, and mount the sun with 1/2″ spacers so the sun ray at the top would go above the clear part of the tent. This worked out perfectly and we were able to make the sign look good while being true to the logo. The sun, along with the rest of the sign, was also made from acrylic and custom painted. for the “S” and “C” in “SOCAL”, we put digital prints on the faces after painting because of the gradient caused by the “sun”. For the white sun detail, we simply cut out a piece of white vinyl and applied it at the end. The sign looks great, and the logo colors work very well with the existing color of the building.